Izh is a technological two wheeled machine with more bells and whistles than a modern car. Izh is a well-known producer of weapons (the most famous example is the "Kalashnikov" machine-gun). However, about the production for the civil market, the Izh was not only an automotive factory, but also the main Soviet motorcycle factory before the fall of the USSR, with a production even more massive than the IMZ-Ural. Considering that the Izh was the main Soviet motorcycle factory, and that the USSR was the second producer of motorcycles (after the Japan) until the early '90s, it possible to say that this Russian brand was one of the greatest factories in the world about number of production (11.000.000 of bikes produced since the 1927). But, in spite of these numbers, it's almost totally unknown in the Western countries. The motorcycle production started already in the 1927, when the engineer P.V. Mozharov realized the a big V-twin bike Izh-1 (the engine was placed transversally, Guzzi-style), 1200 cc, three-steps gearbox with final shaft drive, 23 hp, and with an original frame in stamped steel foil. Moreover, the bottom of the rear part of the frame has also function of muffler. The power comes from a V- twin 849.40 ccm (51.83 cubic inches) generating 140 horses. 50% of the engine is made of heat resistant and highly reinforced plastic. In addition to that the engine has built in wiring and circuitry. Having majority of wires and hoses being built in to the frame and engine reduces weight, damage to wires such as corrosion and decay. Having this feature will enable to have less faulty contacts and make diagnostics more precise. The engine has an automatic smart fuel-regulating system to get the best mpg. In addition to that there is a brushless 60kw electric motor that is built in the rear rim, with a small 2 speed gearbox. The power to the electric motor comes from a Lithium Sulfide Battery (Li2S) that is located at the rear of the engine. Note that Li2S batteries hold four times the energy of Lithium ion batteries. This hybrid combination should be giving out around 80mpg. A 6 speed clutch, with an available automatic transmission. All that power is stopped with powerfully but very precise magnetic brakes with a hydraulic back-up system. The bikes clutch, braking and throttle are all electronically controlled for more precise driving experience. First the main and most important safety feature is the dual airbag. The key in a front end collision is to keep the bike straight and stable so the front takes all of the force, because bikes don’t have that crumple zone like cars. I have decided to create one. First, the front airbag, it takes about 50 % of the hit and keeps the back tire stable to the ground. In most cases, in a front end collision the bikes back almost works as a catapult that launches the rider forward. The front airbag also keeps the main airbag farther from the object. This gives the rider more space to be caught with an airbag. The main airbag has a unique design to it. The pointy arms catch the riders shoulders, blocking the body from moving forward. The skeleton fork design works as a crumple zone. Upon impact the forks lock forward to take the maximum hit at the correct angle. With this safety package the rider is more likely to survive and sustain a minimum damage to the body in an accident. The bike is also equipped with a proximity regulating radar system that works together with a front facing onboard camera. It can be programmed for any distance between the bike and an object. So if a car in front of you unexpectedly breaks the system will automatically brake or slow down to keep the minimum distance. The radar/camera can detect an object as small as a bunny. The camera also has night vision capabilities. Every potential danger is displayed on the onboard 3D LCD. The object will be outlined on the LCD so the rider will know where the potential danger is. This is usually helpful during poor visibility. The handlebars will vibrate to warn the rider of a possible warning... car too close, blind spot, pedestrian, and etc The bike also has proximity side sensors to detect blind spots, the blind spot markers are located on the of the side mirrors. Other safety features include: advanced traction control that has a automatic ability to adjust to ice, water dirt oil; an accelerometer to let the headlights turn when you turn; stabilizer to avoid wobble and advanced ABS. Front intakes are not only for esthetic purposes but are a major part of the construction. 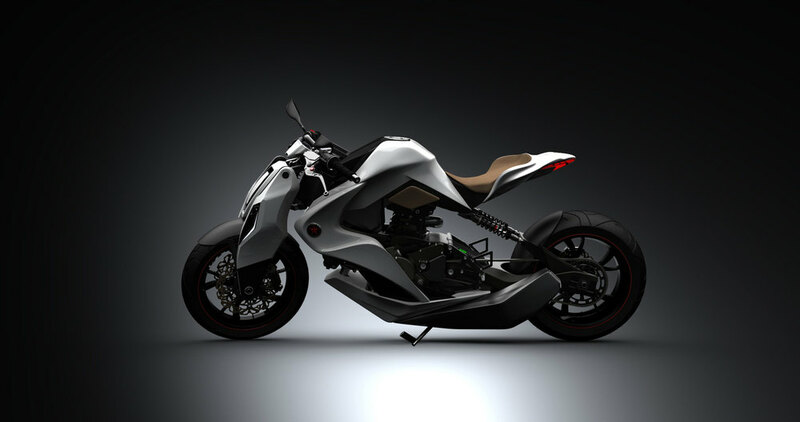 First they provide a steady flow of air to the radiator, secondary they work as aerodynamic stabilizers to the front when the bike is traveling at higher speed... Daylight running lights are also a standard feature. In a modern world we need to stay connected 24/7. That is why this motorcycle has everything you need to stay connected to the world. The onboard computer regulates/adjusts everything to have a safe and comfortable journey. The way the main unit talks to you is via on board 3D Touch screen LCD. The LCD displays warnings, maintenance that has to be done, diagnostics and etc. The bike has 3 modes: sport, comfort and manual. One of the most interesting features is the bikes connection to the real world. Izhs display uses an augmented reality technology. Augmented reality is translated through an HD camera build into the front with night vision capabilities. With this technology GPS navigation has been translated in real time. The navigation pass is overlaid into what the camera sees and displayed on the main display. This also makes it easier way to find commercial points of interest. Augmented reality also works as a safety features to outline potential hazards. Another interesting feature is ability to remote control your mobile device on your main display. Izh will connect with any major mobile OS: iPhone, Windows, Blackberry, Symbian, Android and etc. With this feature the rider will have an ability to answer a phone call without reaching into a pocket by pressing on a control scroll wheel located on the left handle bar. Answering phone calls is only feature that can be used while in motion, for safety reasons. When the bike is at a standstill the rider can take full advantage of their phone: SMS, web, video, apps and etc. Standard connectivity features full on GPS, Bluetooth 4.0, Wi-Fi and 4G. In conclusion the Izh concept is a first step into a new technological revolution that will await us in the future.